The advent of railway and steamship transportation during the mid-19th century started a mass intercontinental and transcontinental migration unequaled before or since. Between 1860 and 1920, more than 45 million people left overpopulated Europe, with over half of this number arriving in the United States. Many of these immigrants progressed with the industrial expansion of America. They learned English, worked hard, made good, and were successfully assimilated into their new country. King Vidor’s epic 1944 film, An American Romance, chronicles a Czech immigrant’s rise from humble beginnings to a position of wealth and power. (1) When Stefan Dangosbiblchek arrives at Ellis Island in 1898, he is almost sent back when it is discovered he does not have enough money to pay the entrance fee. His moving protest convinces a sympathetic interpreter/immigration official to sign his papers. He must make it to Minnesota to meet his cousin, Anton Dubschek, who has a job for him. He embarks on a 1000-mile walking journey from Manhattan to the Mesabi Range in northeast Minnesota. On his way, he performs odd jobs in exchange for food and shelter. When Steve Dangos (the Americanized form of his name) arrives in Minnesota, he wants to begin work immediately and is amazed at how much money he will get for digging and collecting iron ore. His first job pays $6 per week, of which he gives Anton $2 per week to repay him for buying the ticket for his boat ride to America. Steve and Anton move further west to obtain better paying mining jobs. Steve is fascinated with the iron and steel industry and wants to learn how to read and write so that he can learn about iron and steel production. He wants to learn all he can about iron ore and its uses. He wants to know where it goes after it leaves the mine and to understand how iron ore gets turned into steel. Steve asks local Irish schoolteacher, Anna O’Rourke, to teach him to read English. She teaches him how to read and acquaints him with the encyclopedia. In time, Steve and Anna fall in love. Steve attends a 4th of July picnic filled with beer, music, baseball, and patriotic speeches. One speaker says that America is a land of unbounded opportunity in which anyone’s son can become President. The highly motivated Steve asks, “Is that true?” He is always looking for better opportunities to flourish and to achieve his American Dream. Steve plans on continuing to work at the Mesabi mine in order to be with Anna. She reminds him of his ambitions and encourages him to pursue his dreams elsewhere. When the last railroad car is leaving with the last of the ore mined during the summer and fall months, he tags along with the iron ore by rail to Duluth and then travels by freighter to Chicago where he finds work in a steel mill. He does this by sneaking into a mill where he picks up a shovel and begins working. A manager comes by and asks who he is for payroll purposes. Steve gets a job as a “goggle man” and almost dies due to a spill of molten steel. He asks Anna to move to Chicago and they marry and start a family. Their first child is a girl, Tina. Ever the patriot, Steve names his four sons after American presidents: George Washington, Thomas Jefferson, Abraham Lincoln, and Theodore Roosevelt. As Steve gains promotions, he learns each new stage of the steel-making process. He becomes a foreman of rolling ingots where he analyzes the process and implements changes to make it more efficient. He takes a risk and doubles production, simultaneously passing two slabs of hot steel through the process. A persistent and passionate student, Steve learns the details of how iron ore, coal, coke, and limestone are combined with men’s labor to produce steel. He is friendly with his coworkers and stands at the gate of the mill at the end of the workday on Christmas Eve to wish each worker a Merry Christmas. Steve saves enough money to buy a car in 1918, which is the year in which his oldest son, George, graduates from high school. The car breaks down on the family’s way to hear George’s valedictory speech. Steve becomes curious and disassembles the car in order to figure out how it works. This incident thus ignites Steve’s desire to learn all he can about automobiles. He subsequently spends a lot of time taking the car apart, reassembling it, and improving it. George delivers a moving valedictory speech in which he talks about the future and how proud he is to be an American. George enlists in the army and says that for his graduation present, he wants his father to become an American citizen. Steve studies diligently in order to obtain his citizenship. On the day that Steve is scheduled to take his test, the family receives a telegram saying that George has been killed in World War I. The grief-stricken Steve keeps his promise, takes the test, and becomes an American citizen. Steve continues to rebuild and upgrade his car, making it safer and faster. He uses many steel parts and installs an ignition starter to replace the hand crank. George’s former literature teacher, Howard Clinton, stops by to offer Steve and Anna his condolences and to bring them some of George’s poetry from school. Steve invites Howard to test-drive his rebuilt car. They are arrested for traveling 80 miles per hour and Howard suggests that there are prospects for George’s car in Indy car racing. They go to Indianapolis to race the car, have a wreck, and end up in the hospital. "An American Romance is an epic of steel, documenting the entire steel production process, from the mining of iron ore to the making of steel to the manufacturing of automobiles and airplanes. The two entrepreneur-inventors develop the Danton Safety Six which has a steel top and a suspension-mounted engine. The steel roof protects passengers in the event the car is rolled over and the added suspension keeps the car from shaking when it is running. They move their families to Detroit, create the Danton Auto Company, and build a prototype to present to a large automobile manufacturer who is interested in acquiring the design and patents but not in actually producing the car unless or until a car with similar features is introduced by a competitor. Rather than having their design shelved by the large car company, Steve and Howard decide to continue improving their prototype car and to enter it in an upcoming New York auto show. Steve’s cousin, Anton, provides much-needed financial help at this time, supplying the money needed to start the business and to produce the prototype. At the auto show, Howard locates financial backers who are willing to invest five million dollars in Steve and Howard’s company in order to produce the Danton Safety Six. Steve becomes a motor magnate with stockholders and autoworkers. Teddy, Steve’s youngest son, graduates with an engineering degree from college, and goes to work for his father’s company. Teddy insists on starting at the bottom of the company so that he can learn about all aspects and levels of the business. Years later, Teddy plays a major role in the unionization of Danton’s employees. Although the working conditions are good, the workers want a union for security reasons. They want to make certain that they will have their jobs and receive fair wages and treatment regardless of who is heading up management. Conditions change over time in the United States and employees rely more on large corporations than on farms and small businesses. Times have continued to change, and today, in 2009, we often see unions demanding more benefits than a company can afford to pay (e.g., in the automobile industry). Despite having empathy for his employees, Steve stubbornly objects to a union, maintaining that it is the owner’s responsibility to take care of his employees. He argues that he has built the company and that he has always treated all of his employees well. He sees no need for a union and says that management will lose control of the company as time goes on. Steve perceives that he is the only person who built the company, ignoring the contributions of others such as Howard, Anton, and Anna. He sees himself as a self-made man. The workers walk out, refusing to work until the board agrees to meet with the employees. After a bitter three-month strike, the board meets and every member except for Steve is convinced that having a union will benefit both the workers and the corporation. Teddy speaks on behalf of the workers, and reminds his father that it is not his company alone, and that he has a responsibility to the stockholders. Steve is disillusioned and believes that he has been betrayed by Teddy, Howard, and Anton. He retires and goes to California for a long-overdue honeymoon with his wife, Anna. Steve and Anna settle in California until Pearl Harbor is bombed and Teddy informs Steve of a deal in which Danton will manufacture bombers for the American government for use in World War II. Steve and Teddy are reconciled and reunited when Teddy asks his father for help with the manufacture of warplanes. An American Romance is a fine film portraying how an immigrant’s hard work, courage, determination, persistence, and ability to take risks can lead to the achievement of his American dream. It is also an epic of steel, documenting the entire steel production process, from the mining of iron ore to the making of steel to the manufacturing of automobiles and airplanes. 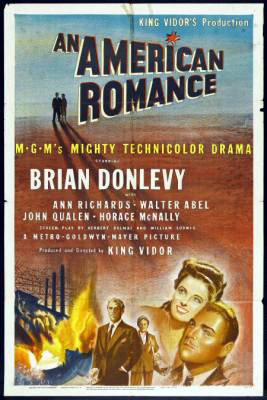 In addition, it is a film filled with much American propaganda, as evidenced by: the 4th of July celebration; the naming of Steve’s and Anna’s male children after American presidents; George’s speech and his enlisting during World War I; Steve’s gaining of citizenship; and, most of all, the manufacture of bombers for use in World War II. Director King Vidor had to deal with several problems during the production of the film. First of all, during World War II, there were no passenger car assembly lines in operation. As a result, Vidor had to borrow cars from Chrysler, take them apart, and reassemble them in a simulated assembly line. In addition, costly post-production editing and scene rearrangement led to 30 minutes being removed from the film. Vidor thought that the cuts in the film would come from the documentary scenes in the film, but that footage had already been set to music. The cuts came out of the dramatic portion of the film, and the re-edited final version emphasized the documentary and technical aspects of the story rather than the personal drama. Despite these cuts, the end result is an inspiring film of American capitalism as a system of unbounded opportunity. 1. I would like to thank film-blogger, Zachary Campbell, for supplying me with a DVD copy of An American Romance.